Copyright © 1997 Balmoral Software (http://www.balmoralsoftware.com). Portions copyright © 1995 Snow Lion Entertainment Group. All rights reserved. Republication, redistribution or conversion is expressly prohibited without the prior written consent of Balmoral Software. Contents subject to change! For the latest information, see http://www.balmoralsoftware.com. Isis is an interesting attempt to blend a traditional adventure game with live concert footage that might be enjoyed by Earth, Wind & Fire fans. While the concert was of no particular interest to us, as the payoff of the game we found it a diverting change of pace from the usual type of adventure game finish that can often be anticlimactic. However, the adventure game itself is very short and its graphical presentation quite limited, so the whole package seems rather overpriced unless you can find it in the bargain bin. The interface is based on standard Director middleware, which enjoyed widespread use in the adventure titles of a few years ago. Nearly all locations are rendered (at a relatively low level of detail) and movement between locations is animated with QuickTime movie segments. While the interface is dated by today's standards, it does seem superior in some respects to the slideshow style of presentation that has made a resurgence in a few recent titles. However, the game's viewport is severely restricted in size, so gameplay quickly gives the impression of playing in a tunnel. Integrated full-motion video segments have a professional appearance, and the performance by Veena Bidasha as the goddess Isis is first-rate. In video segments liberally sprinkled around the game, she offers background information and clues about your goals in the game. Ambient sounds are minimal. Save-game slots are limited to only three, but may be expanded if you rename the ISIS?. files in the Windows directory. Click on the viewport to skip the introduction and begin a new game (unfortunately, those cool-sounding footsteps do not continue in the game). The floppy-disk button at left can then be used to restore a game in progress. The inventory display disappears after an inventory item is used or after a video sequence - remember to use the "i" button to the left of the viewport to make the inventory visible again. Using the Esc key will immediately exit the game. You can carry or obtain only one gemstone at a time, pretty much in a prescribed order. Move L2 F, open the sarcophagus and pick up the scepter inside. Move R2 F L F L F R to the waterfall and watch the introductory Isis animation. Move F and put the scepter into the receptacle. Move R2 F L F L F R F2 to the deck of the schooner and watch the animation in which Isis tells you she will unbar the doors of the ship. If desired, move L and look through the telescope at the erupting volcano, then move R.
Move F4 R F through the ship into the library and pick up a chess piece from the chessboard. Move L2 F2 L and pick up the golden earth icon from the picture of the schooner. Move L F L F and watch the Isis animation describing a cultural archive. If desired, move R F and activate the viewer to watch interviews of Earth, Wind & Fire personnel, then move R2 F R2. Move L F and open the chest to pick up the purple navigation globe inside. Move R2 F L2 F L F and examine the sheet of symbols lying on the table. Move L2 F R F3 UC F LC into the navigation chamber in the aft end of the ship. Press the button to open the receptacle, then place the globe inside. Move F through the receptacle to a table on the far side of the room. Open the wooden box and pick up the golden beetle icon inside. Move L2 F2 L F and watch an animation of Isis describing the schooner's navigation. Move L to the navigation control panel and click on the light-blue control knob to activate the navigation globe. in any order, then wait for the navigation coordinates to be entered and the globe to disappear. 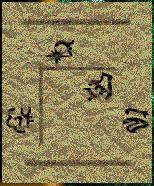 Move L F R UC UC L F L off of the ship and pick up the golden bird icon lying between two marble columns. Move R2 F L F R F L to the top of the waterfall and return the chess piece to the chessboard. Pick up the green gemstone. Move L F L F R F2 R F4 L2 LC F2 into the schooner's engine room and press the hexagonal button to open the engine compartment. Drop the green gemstone into the engine. Move R and open the engine room locker using the handle at the top. Pick up the oilcan and wrench inside, then move R F.
If desired, move R and press the far-right button for a brief (20-second) Earth, Wind & Fire video segment. The other three buttons may be pressed for incidental animations. Move L and watch an Isis animation describing Earth, Wind & Fire music as "the gift of healing". I feel better already. Move F2 R2 UC F UC and watch an animation of Isis describing the return of the golden icons to the main schooner control console. Move UC L F R F L F R F3 R2 to the large gears in a corner of the pyramid and use the wrench on them to activate the sun portal. Move R F3 L F R F2 R F R2 LC back to the control console and open it. Press the large golden button at right and watch an animation showing the location of the fire gemstone. Move L and watch an animation of Isis describing the "dead-man's brake" feature of the control console. Move UC L F R F L F L F2 to the Sun Chamber, then pick up the fire gemstone after it's revealed. Move R F2 R F R F2 R F4 L2 LC F2 back to the engine room, open the engine compartment and deposit the fire gemstone. Move R2 F3 R2 UC F UC UC and then click the forward-pointing ankh icon a little to the left of the stairway leading up to the inflator on the top deck of the schooner. Move R, open the topside compartment door and pick up a net and match from inside. Move R F L2 F2 R2 to the inflator and use the oilcan in the funnel at upper left. Open the ignition chamber at lower center and light the flame using the brownish match in your inventory. Move R3 and activate the blue-and-black control panel to inflate a balloon and disclose the wind gemstone. Use the net to capture the gemstone, then click on the control panel once more to deflate the balloon. Move R2 F and watch an enthusiastic Isis animation. Move F5 L2 LC F2 back to the engine room, open the engine compartment and deposit the wind gemstone, after which an interesting (but very short) honky-tonk piano segment plays repeatedly. Move R2 F3 R2 UC F UC LC back to the control console and open it. Place the three golden icons you've been carrying into the console. To activate the schooner and initiate the endgame sequence, press each of the three icons on the console. After the schooner flying sequence and excited Isis animation finish, you'll be treated to an 8-minute QuickTime movie of the disco sounds of Earth, Wind & Fire. If you watch the sequence all the way through, the game will indicate a replay hotspot in the library, but it's not clear how you could reach it since game credits roll and the game restarts at that point. If you want the replay the concert sequence, you can use your QuickTime Movie Player on the 96-MB \ISISF\MEDLEY\MEDLEY.MOV file on the CD-ROM.